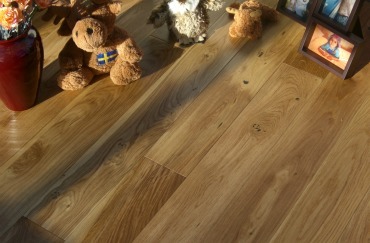 Probably the most common factory applied coating applied to wood flooring. It is normally applied in multiple coats, perhaps five to seven, through an industrial lacquer line, with the top coat applied being extremely hard wearing and often having ultra violet inhibitors, to slow the changing of colour of the wood, with exposure to sunlight. Specialist flooring lacquers are designed to give a hard level of protection to the wood beneath but it must be noted that even the hardest lacquers will scratch if, for example, exposed to grit or abrasion. The pressure of a stiletto heel will also mark the hardest lacquer on even a very hard wood such as Oak or Maple. Lacquers can normally be specified to give various levels of sheen from matt (looking similar to an oiled finish) up to high gloss (looking almost like a glass finish). Generally the higher the sheen or gloss the more any scratches or blemishes will show.